A truly unique and easy-to-use Bible study tool, with almost 40,000 Bible references, "So That's in The Bible?" offers insighful perspectives on many of today's "hot topics" and provides a wealth of little known facts that make Bible study fun. The popular trim, easy-to-handle format comes packed with additional features, including a topical index, Bible biographies, geographical sketches and much, much more. 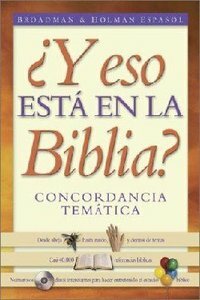 Una herramienta de estudio biblico original, con casi 40,000 referencias biblicas, "Y Eso Esta en la Biblia?" ofrece perspectivas interesantes de muchos temas de actualidad, y proporciona gran cantidad de datos pocos conocidos que hacen que el estudio biblico sea entretenido. El popular y comodo formato incluye caracteristicas adicionales entre las que se encuentran un indice tematico, biografias biblicas y bosquejos geograficos, entre otros. - Publisher Now available in Spanish. Compatible with any Spanish Bible version, "So That's in the Bible?" offers insightful perspectives on many of today's hot topics and provides a wealth of little-known facts that make Bible study fun. About "Eso Esta in La Biblio (So That's In The Bible)"
Now available in Spanish. Compatible with any Spanish Bible version, "So That's in the Bible?" offers insightful perspectives on many of today's hot topics and provides a wealth of little-known facts that make Bible study fun.